While some of us use their basement as an extra living space, many people use it as a laundry room, storage space or work area. When this area is flooded out, it can be disastrous and might require a number of services besides just frying up the water. You might also need carpet and upholstery cleaning, mold remediation, sewerage clean up and more. When you basement gets flooded, it is often a good solution to call in an all-in-one professional company to deal with the disaster. Make sure the basement is safe to enter before doing so. Ensure you wear protective gear in case of sewerage contamination. Switch the electricity off at the main fuse box if possible to avoid being shocked. Do not use any electrical appliances until an electrical expert has checked that it is safe to do so. Be on the lookout for rodents, snakes, reptiles and insects that may have been brought in by flood water. Do not enter the basement if there appears to be any structural damage at all. What is the process to restore your basement? Make sure that your house owner’s policy covers you for water and flood damage to your home. Give them a call with details of the incident and an inventory of the damage if possible. Get hold of a professional remediation company that can assist with the flood damage, sewerage clean-up if required, mold remediation and carpet and upholstery cleaning of needed. They can also advise you on how to handle your unique situation. Generally, once determining that the area is safe to enter, a basement restoration company will start off by removing any undamaged items, then extracting all the excess water, normally using a sump pump or similar high capacity pump to drain off the worst of the water. They will then drain the balance using a wet/dry vacuum or similar machine. Once all the excess water is gone, they will use natural airflow if possible as well as fans to dry the area out and remove excess moisture in the air. They will then look at helping you salvage furniture and equipment that can be salvaged, such as cleaning carpets and upholstery and drying out of equipment that was not contaminated by anything other than water. Damaged books, paper and cardboard may need to be discarded, depending on the flood damage and if there was any contamination. They will also treat to prevent mold infestation as far as possible. Make sure you do not bring any items into the basement that are still damp as this could also cause mold. Make sure that you do what you can to prevent the damage from occurring again in the future by regular maintenance and checking of pumps, insulation, piping and so forth where the incident is due to a malfunction of equipment or an accident in the home. 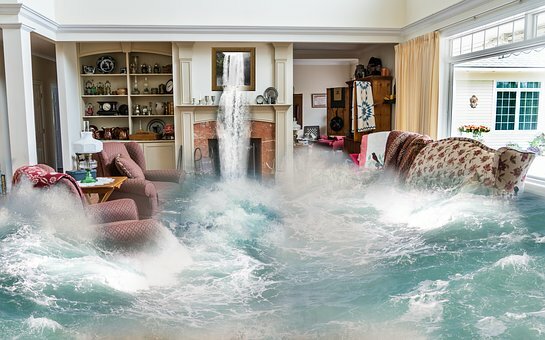 Where the damage is caused from external flooding, you may need to look at drains, landscaping and other ways of reducing the potential for a basement flood in the future.